On May 17, 2017 Brian Stanton of GreenWood Resources, Inc. sat down to chat with Jenny Kalez, Oregon Department of Energy’s (ODOE) public affairs and outreach coordinator, for an episode of ODOE’s new podcast, Grounded. Grounded started in March of this year. The podcast is designed to explore increases to energy efficiency and innovations in energy technologies across Oregon state. There have been five episodes so far, each covering a different aspect of energy. “We were excited to launch our new podcast, Grounded, as a way to share and celebrate the really cool energy work that’s happening across our state,” says Kalez. Topics so far have included the history and significance of the Hanford Nuclear site and an Oregonian public utility’s experience responding to a crisis created by a major ice storm last winter. 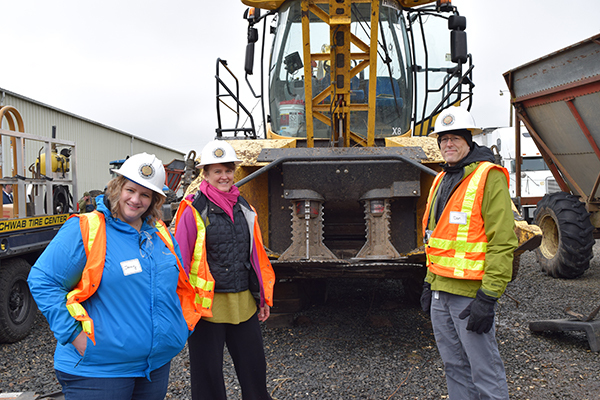 Kalez, along with other ODOE employees, came out to AHB’s Jefferson demonstration site in February to see the tree harvester in action. Unfortunately, due to an unseasonably wet winter and a flat tire, the harvester was not running when they could get away from the office. But, they did have the opportunity to get to know more about AHB’s renewable energy goals and meet team members, like Brian, who are working hard to make them happen. Oregon Department of Energy employees pose in front of the harvester at the Jefferson Demonstration site. As the lead of the feedstock team and a poplar enthusiast, Stanton is often called upon to talk about AHB’s bioenergy trees, but this was the first time AHB has been the focus of a podcast. The episode highlights one of the primary goals of the AHB project: poplar biojet fuel. Stanton explains the versatility of poplar trees, their role in GreenWood Resources development as a company, and how they can be used effectively as a feedstock for biofuels.